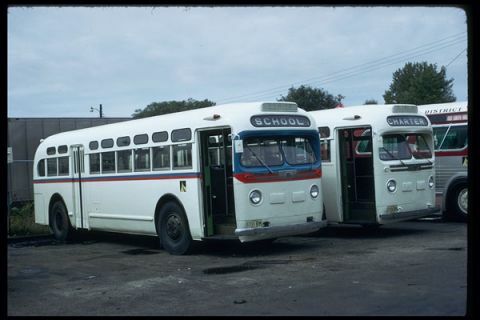 CUMTD #3603 at the garage in September, 1971. Photograph taken by A.J. Reinschmidt. Because several of the 4517s required extensive rebuilding, the MTD obtained four 3610s from Dayton. These arrived in white paint and had the orange and blue stripes added after arrival. Shortly after the MTD assumed operations the university began operating the Assembly Hall route with vans, reducing the number of buses required by the MTD. Upon completion of the rebuilding of the ex-Peoria buses, the 3610s were no longer required and followed the previous group of 3610s to Bloomington-Normal.